Contract manufacturers (CM) play a very important role when it comes to the manufacturing medical products. Even though contract manufacturing is a form of outsourcing, it benefits medical device organizations in a number of ways. By partnering with a right CM, medical device manufacturer can save plenty of time and overhead costs. Especially for those companies that are only starting their operations or are currently facing shortages in resources, contract manufacturing is the apt answer to their problems. Today, contract manufacturing organizations are looking at new technologies with the aim to boost economies of scale, improve manufacturing productivity, and overall efficiency. Manufacturing organizations are currently using AI to generating novel drug candidates, understanding disease mechanisms, as well as aggregating and synthesizing information. Big data analytics also play crucial role in the contract manufacturing industry. Contract manufacturing organizations are largely adopting data integration, master data management, and visualization tools to determine demand forecasts, production planning, inventory optimization and operation planning data. This edition of MedTech Outlook features companies that are at the forefront of offering contract manufacturers solutions. In the last few months, a distinguished panel comprising CEOs, CIOs, VCs, and analysts including our editorial board reviewed the top companies in the MedTech domain and shortlisted the ones that are at the helm of tackling challenges in the Contract manufacturers industry. The companies compiled in this issue have exhibited extensive business process knowledge, along with in-depth and innovative strategies in the space. 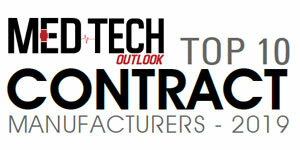 We present to you MedTech Outlook’s “Top 10 Contract manufacturers 2019”. Xact Wire EDM Corporation Combines people and technology to provide precision wire EDM machining to die makers, mold builders and part manufacturers throughout the U.S.